Recently played live at the Bluebird Cafe in Nashville. Invited to perform "Surfin' Killed the Evening News" from the new cd, "Do Whatcha' Gotta Do". 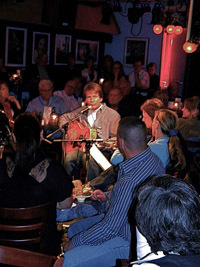 Songwriter Tom Manning hosted the writer's night, and played several of his songs being pitched to various artists around town. A special thanks to songwriter Tom Manning (left) along with grammy award winning songwriter Larry Henley. Tom performed one of his many killer songs including "Shoulda' Had a Prenup", which i have no doubt you'll hear on the radio someday. 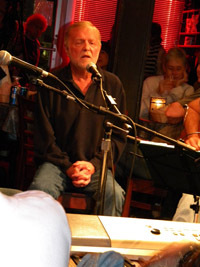 Larry performed the song he's best known for co-writing, "Wind Beneath My Wings".